Over the coming semester, the Sussex Humanities Lab is offering a series of free skills-building workshops in the Digital Humanities. They take place on selected Wednesdays between 15:00 and 17:00, in the Lab. 15:00, 6 Feb – Clean Your Data. When datasets arrive, they are often vast and messy … and machines can be very fussy readers! In our first 2019 workshop, Ben Jackson explores a range of tools and techniques to tidy and transform text data, readying it for all kinds of analysis and adventure. Find out more or book a place. Note: Ben’s February workshop is a repeat of the workshop he ran in September 2017 to universal acclaim. 15:00, 19 Feb – Archival Research with Tropy. Collecting and managing photographs from archives can be time-consuming. In our second 2019 workshop, Sean Takats will introduce you to the free software package Tropy, and help you to manage the process of taking, saving, and describing photos of archival materials. Find out more or book a place. Note: This one’s on a Tuesday, time TBC. 15:00, 13 March – Web Scraping with Wget. Wget is a very handy program for retrieving or ‘scraping’ material from the web. In this workshop, James Baker introduces your computer’s command line interface, and shows you how to write simple scripts to automate bulk-downloading from the web. At the end of the workshop, James will support you in scraping a website of your choice. You’ll also learn about The Programming Historian, a fantastic resource to gain more digital skills in the future. Find out more or book a place. 15:00, 3 April – Dataset Publishing and Compliance. Data repositories are already an important part of humanities research, and increasingly a requirement of humanities funding. In our fourth workshop, Sharon Webb and Adam Harwood will dive into the practicalities and best practice of research data management. We’ll explore how best to use metadata to describe and organise digital objects, touch on issues within digital preservation, and learn how to use current university infrastructure to deposit datasets. Find out more or book a place. 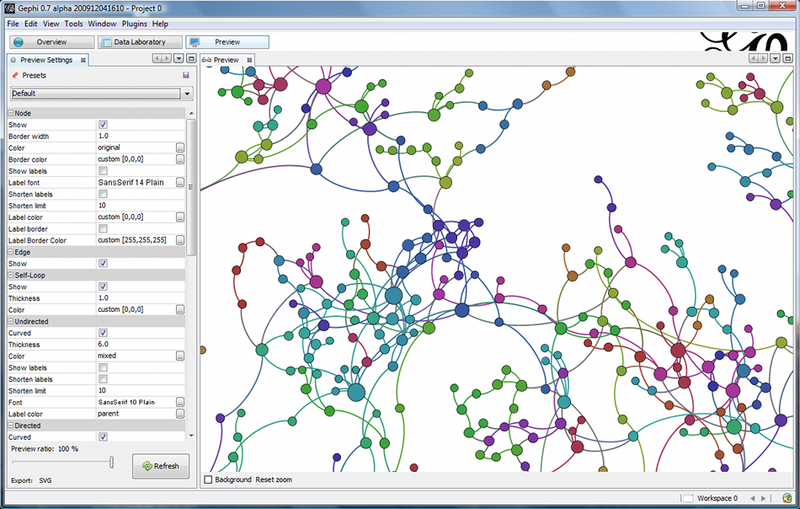 15:00, 10 April – Network Visualization. In an increasingly interconnected world, the network has emerged as a major category of analysis for humanities and the social sciences research. In our fifth 2019 workshop, Andrew Salway introduces the popular dataviz tool Gephi, exploring how dry, cryptic datasets can efflorescence into colourful significance … and exposing some of the hidden choices that underlie the dataviz we encounter in everyday life. Find out more or book a place. 15:00, 1 May – Conserving Software-Based Artworks. Software-based artworks pose many challenges to conservators. Such art may involve complex systems of interconnected components and actors, aging technologies with a variable degree of significance, and boundaries which extend into their surrounding environment. In this workshop Tom Ensom and Chris King, who work closely with Tate’s collection of software-based artworks, will explore how disk imaging and emulation techniques can be used to address these challenges. Find out more or book a place. 15:00, 15 May – Data Modelling. Workshop led by Sharon Webb and Anna Maria Sichani. More information and Eventbrite coming soon. The Digital Methods Open Workshops series is free and open to everybody. We aim to cater to all levels of ability and experience, both across the series as a whole and (as much as possible!) within individual workshops. The first two events are especially suitable for researchers who are just starting to dip their digits into the digital humanities. Workshops normally take place in the Lab on Wednesdays 3-5; anyone who wants to can come along from 2 for some extra support in getting set up. We will be announcing further workshops shortly. Past workshops have covered skills and tools related to digital forensics, machine vision, corpus linguistics, web-scraping, augmented reality, the integrated visualization of qualitative and quantitative knowledge, and much much more.